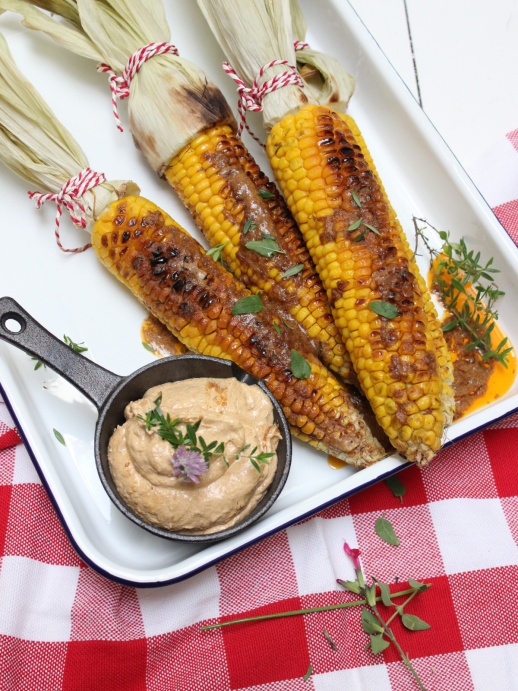 Secretts of Milford's perfectly cooked fresh sweetcorn is a great accompaniment to an autumn dish as Eat Surrey's Shirlee Posner demonstrates with this simple recipe that can be cooked in the oven or outside on the BBQ. Preheat the oven to 190°c / Gas Mark 5 or cook on a pre-lit BBQ. Trim the outer leaves leaving enough intact to protect the corn during cooking. Remove the silk and pull the leaves back over the corn. Place the corn in a baking tray in the oven or on the BBQ. Roast in the oven for 30 minutes. A BBQ should take 20 minutes but turn every few minutes. Heat the oil in a frying pan and add the onions. Cook for 2-3 minutes and stir in the garlic cook for a 2 minutes, and then add the spices, herbs and seasoning. Pan fry for 1 minute and add the water and reduce. When cool, place in a food processor with the butter and blend until smooth or in mixing. bowl of a stand mixer and whisk until light and fluffy. Place in a serving dish to serve with the corn. Remove the husks from the corn and spread on the butter and serve immediately.